Life Before the Dinosaurs: Orthrozanclus. 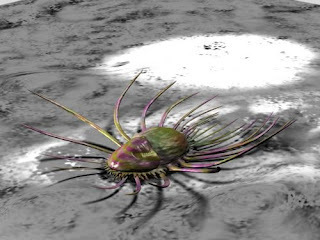 Orthrozanclus was a weird spiny halwaxid with two plates of armor on top of its body, and surrounding them were scale-like plates on the bottom. It used its squishy foot to move along rocks. 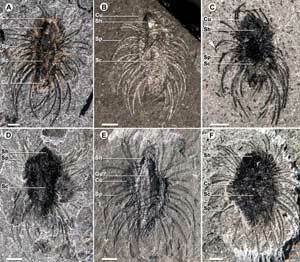 It had many protective spines surrounding the edge of the body. 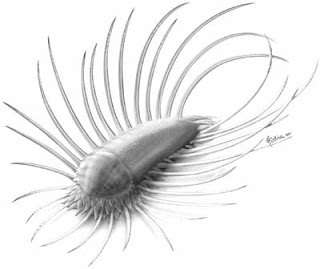 But this defense didn't work with some monster predators, such as Anomalocaris, because Anomalocaris could crunch right through those spines and get to the soft Orthozanclus inside. Orthozanclus had so many spines because it was not fast and could not swim to escape from predators like its relative Odontogriphus. I love reading your posts, I learn something new everyday! I would love to have you guys on Family Network Radio. Contact me at susan@familynetworktv.com if you are interested. Also, would like to invite you to write blog for our news feed! Crunchy on the outside, soft on the inside, spiny around the middle? It's three three three taste treats in one!